Nearly twice as many social media users say they are “worn out” by the amount of political content they see in their feeds (37%) as say they like seeing lots of political information (20%). 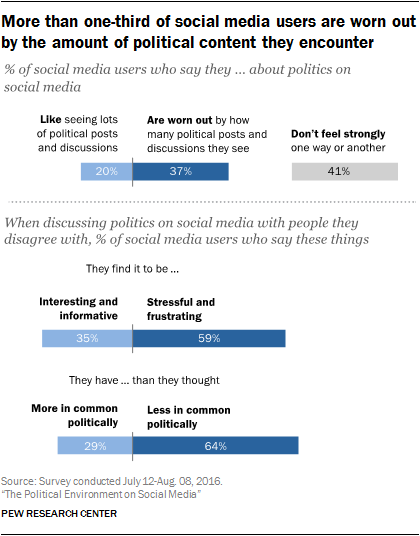 Still, about four-in-ten (41%) indicate that they don’t feel particularly strongly one way or the other about the amount of political content they encounter on social media. 59% say their social media interactions with those with opposing political views are stressful and frustrating – although 35% find them interesting and informative. 64% say their online encounters with people on the opposite side of the political spectrum leave them feeling as if they have even less in common than they thought – although 29% say they end these discussions feeling that they have more in common than they might have anticipated. When asked how they view the tone of the political discussions they see on social media, a substantial share of social media users feel these platforms are uniquely angry and disrespectful venues for engaging in political debate. Some 40% of users agree strongly with the notion that social media are places where people say things while discussing politics that they would never say in person (an additional 44% feel that this statement describes social media somewhat well). Meanwhile, roughly half of users feel the political conversations they see on social media are angrier (49%), less respectful (53%) and less civil (49%) than those in other areas of life. At the same time, a notable minority feels that the political discussions they see on social media are largely reflective of the political discussions they witness in other areas of their lives: For instance, 39% of users feel that these interactions are no more less respectful than other political interactions they encounter. 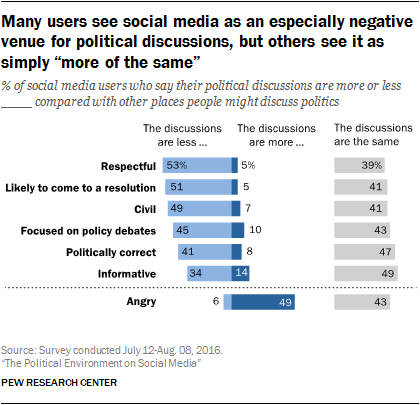 And a small share finds political debates on social media to be more civil (7%), more informative (14%) and more focused on important policy issues (10%) than those they see elsewhere. For the most part, social media users try to refrain from engaging with the political arguments that enter their feeds: 83% of them say that when their friends post something about politics that they disagree with they usually just try to ignore it, while 15% usually respond to these posts with a post or comment of their own. When ignoring problematic content fails, social media users tend to utilize technological tools to remove troublesome users from their feeds entirely. Nearly one-third of social media users (31%) say they have changed their settings in order to see fewer posts from someone in their feed because of something related to politics, while 27% have blocked or unfriended someone for that reason. Taken together, this amounts to 39% of social media users – and 60% of them indicate that they took this step because someone was posting political content that they found offensive. Yet for all of the tensions and annoyances that accompany political debates on social media, some users do see a good side to these interactions. This is especially true of those Americans who indicate a high level of interest and involvement in the political process more broadly. These highly engaged social media users express many of the same frustrations about the tone and tenor of political discussions on social media – but many of them simultaneously view social media platforms as valuable tools for political action and discussion. Roughly one-in-five politically engaged users (19%) indicate that they often comment, discuss or post about political issues with others on social media (just 6% of less politically engaged users post with this level of frequency). And nearly one-third of these politically engaged users feel that social media sites do “very well” at bringing new voices into the political discussion (31%) or helping people get involved with issues that matter to them (30%). The concerns and frustrations outlined above are occurring in a broader context: namely, one in which political discussions are encroaching into a range of different social spaces. Two of the more common social media platforms – Facebook and Twitter – are illustrative in this regard. 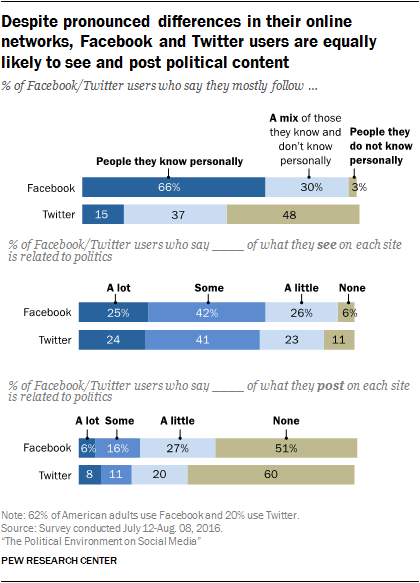 Facebook users tend to be friends primarily with people they know personally (66% of Facebook users say they mostly follow people they already know), while Twitter users are much more likely to follow people they do not know personally (48% of Twitter users indicate that most of the people they follow are in this category). And a large share of Facebook and Twitter users report that they follow a relatively broad mix of people with differing political views and opinions (indeed, just 23% of Facebook users and 17% of Twitter users say that they mostly follow people with political views that are similar to theirs). But despite these differences in the social and political composition of their networks, an identical share of Facebook users and Twitter users report that they frequently encounter political posts and engage in political discussions among the people in their networks.